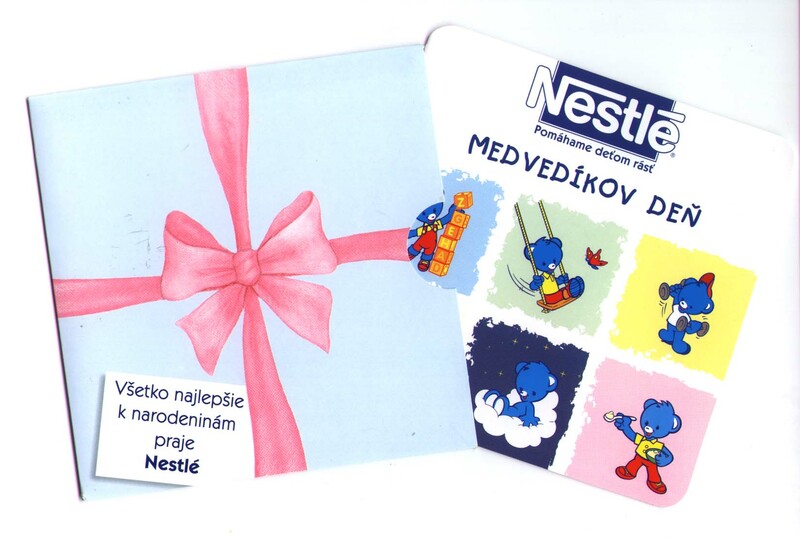 Nestlé targets mothers in Slovakia and breaks '6 month' promise. The International Code of Marketing of Breastmilk Substitutes is very clear in saying that companies should not promote products within the scope of the Code to mothers. Yet 25 years after the Code was adopted on 21 May 1981, Nestle continues to do so. 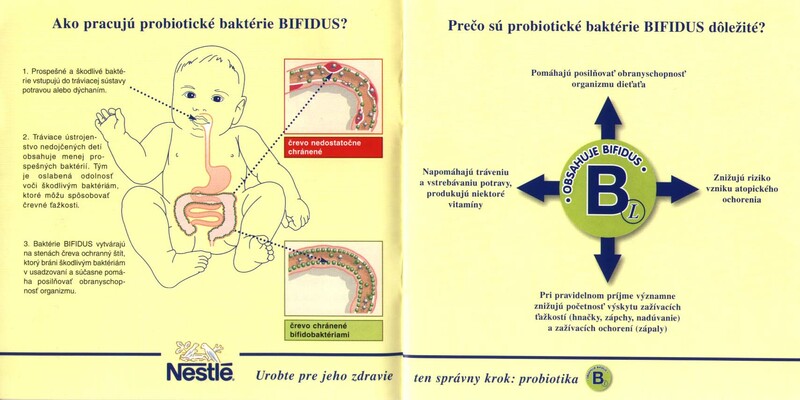 The booklet shown below not only promotes infant formula and other breastmilk substitutes, but makes health claims about the benefits of the formla, idealizing it and undermining breastfeeding. The Code gives responsibility for advising mothers to health workers and companies are limited to providing scientific and factual information to them. Nestle also targets mothers with gifts, such as this children's book, which features the blue bear logo used for Nestle baby foods. In 2003 Nestle claimed it would stop promoting complementary foods for use before 6 months of age. In 1994 the World Health Assembly adopted Resolution 47.5 calling for complementary feeding to be fostered from 6 months and it took 9 years of campaigning to prompt Nestle's change in policy - which was announced during a week of demonstrations at Nestle sites in the UK. Baby Milk Action has highlighted previously how Nestle has not made the required changes in all countries, including Slovakia where a book on infant feeding distributed to mothers promotes use of Nestle complementary foods from 4 months of age. Suggested letter to the man who claims he investigates any hint of a violation, Peter Brabeck-Lethmathé, Chief Executive, Nestlé S.A. Avenue Nestlé 55, Vevey 1800, Switzerland. You can select the text below and copy and paste it into a word-processor or into the comment page on the Nestlé site. Note Nestlé keeps changing the address of the comment page. If the link to it is dead go via http://www.nestle.com/. As you know Article 5.1 of the International Code of Marketing of Breastmilk Substitutes prohibits the promotion of products within its scope. While Nestle claims to abide by the Code, this is clearly not the case. 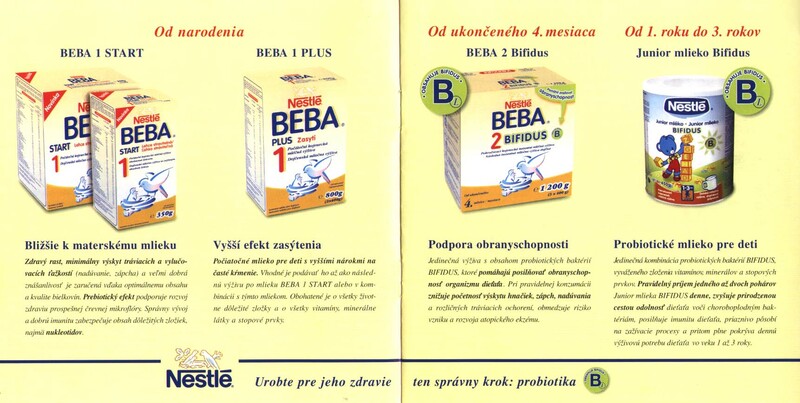 Baby Milk Action reports that Nestle has recently distributed pamphlets to mothers in Slovakia for its Beba infant and follow-on formula. Article 5.4 prohibits companies from giving gifts to mothers, yet in Slovakia Nestle is giving mothers story books featuring the blue bear logo. In 2003 you claimed Nestle was taking the initiative in complying with World Health Assembly Resolutions on the appropriate age of introduction of complementary foods and would stop promoting these for use before 6 months of age. Baby Milk Action welcomed this commitment, but has published evidence showing that booklets distributed to mothers in Slovakia encourage use of complementary foods from 4 months of age. Can you please stop claiming to abide by the World Health Assembly marketing requirements when it is clear Nestle is not doing so and take immediate action to end such blatant malpractice. If you are in the UK or registered to vote in the UK, please contact your Member of Parliament and ask that they sign Early Day Motion 2157. You can send a message to the UK Public Health Minister and to baby food companies wherever you live (see the December 2005 action sheet). We are calling for the Government to take action to implement the International Code of Marketing of Breastmilk Substitutes and subsequent, relevant Resolutions of the World Health Assembly in legislation. The Early Day Motion is a Parliamentary document, like a petition, which Members of Parliament can sign to support this call. 25 years after the Code was adopted, the Government has still not implemented it in legislation. It has claimed it needs to pursue changes at European Union level first. However, it appears these efforts have failed and the European Commission is due to sign off a Directive on 26 June that will legitimise certain violations of the Code and Resolutions. NUMICO has provided cards to health workers for passing to mothers, encouraging them to call the Cow & Gate 'careline' for advice on infant feeding. 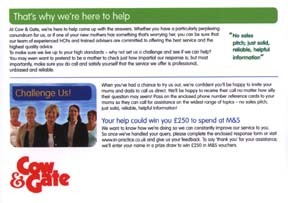 Health workers can win £250 for supporting the 'careline'. NUMICO in Mother and Baby parenting magazine (cover date June 2006) offers mothers £90 in vouchers if they sign up to receive mailings from the company, including information on infant milks. Heinz has promoted Farley's formula in the health care system , linking it to the Government's 'Health Start' scheme. 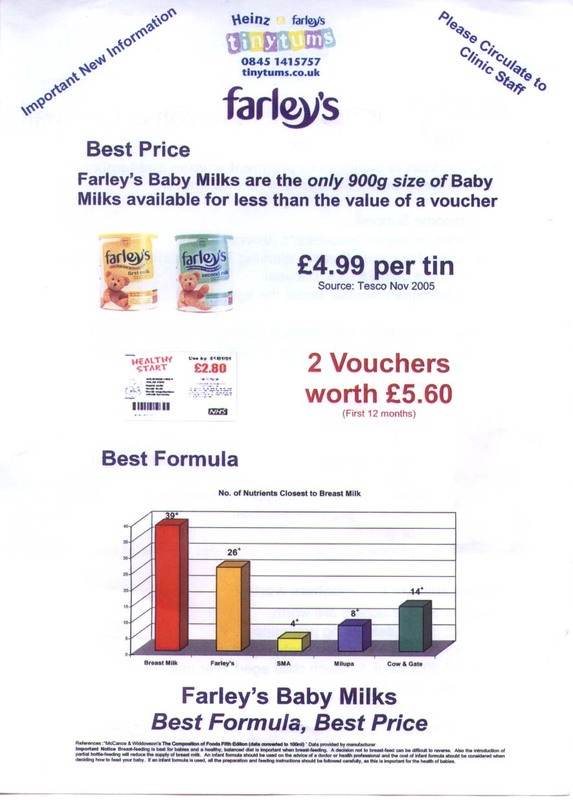 Fliers for health workers claim Farley's formula is the 'closest to breastmilk' - a claim made by other companies. 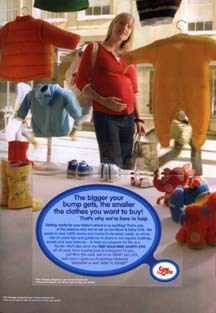 Wyeth promoting its SMA brand through sponsorship of Living TV's Baby Zone (website linked to the programme shown right). This was backed by advertisements in newspapers. 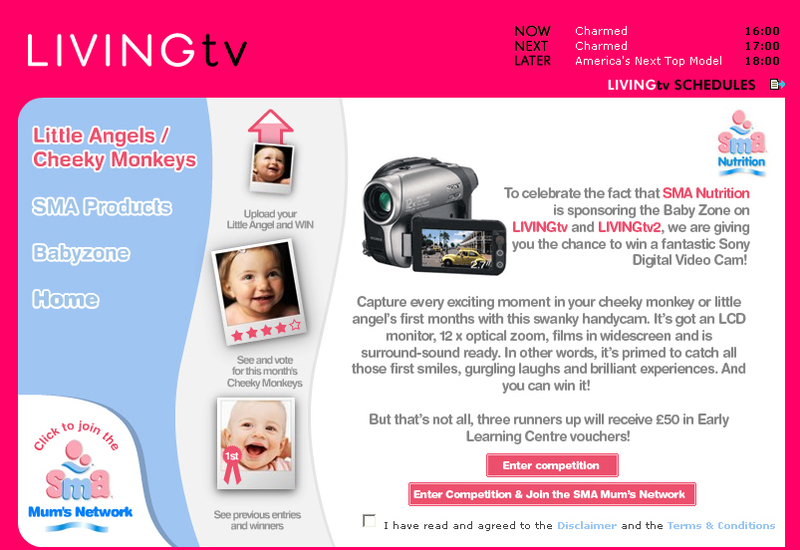 Mothers could win digital or video cameras by signing up to receive information on SMA products. Suggested letter to your MP. You can send this easily using the website http://www.theyworkforyou.com/ even if you don't know the name of your MP. (You can select the text below and copy and paste it into a word-processor or into an email). If you are in another European Union country, please contact members of your Parliament. In addition, or if you are unable to sign the Early Day Motion, I ask that you write to the Public Health Minister, Caroline Flint MP, asking her to take the action called for in it. I am concerned that the UK Government has still not implemented the International Code and subsequent, relevant Resolutions of the World Health Assembly in legislation. The Government said it would pursue changes in a European Directive first, but appears to have failed. The Government must either stand up to the European Commission to win changes in the Directive or go ahead with introducing the minimum standards of the World Health Assembly independently. At present baby food companies are able to target mothers with idealizing information about their products, so undermining breastfeeding and misleading mothers who artificially feed their infants. Advertisements that violate the Code and Resolutions appear on television, in magazines and in newspapers. 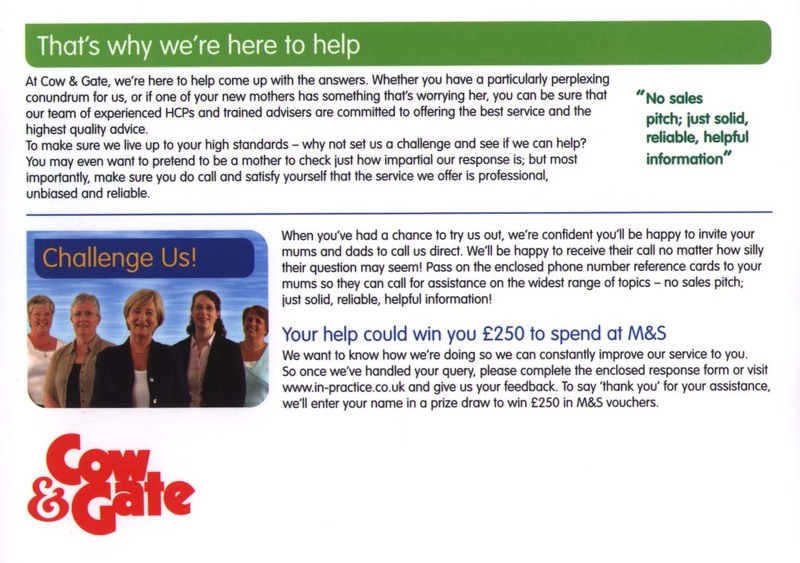 Mothers are offered vouchers to sign up to receive idealizing information from companies. Leaflets are being distributed through the health care system. Health workers are offered cash prizes to encourage them to give company-produced information to mothers. Please let me know if you will sign the Early Day Motion or will be contacting the Public Health Minister about this issue.